Submitted by Norm Roulet on Tue, 04/28/2009 - 11:29. Yesterday was a special day for me - a beautiful day in the region - so I ended it with my good friend Ed Hauser, as I often do. Alone on his own island, he is always easy to find. I was photographing the sunset right by where Ed's boats belong. They are gone... he is now walking on water. Because of Ed, my heart lives on Whiskey Island too, and I have photographed there scores of times. I've been thinking about having a show at Convivium 33 of some of the 1,000s of pans I've produced, showcased on REALNEO. As I was hanging with Ed yesterday, it occurred to me the best subject and cause for that is Ed, so the show will feature only Ed and Whiskey Island and all proceeds will further Ed's good work, however that may be determined. I'll post smaller versions of the pans here on REALNEO for a virtual May Show, as I get them together for the real world. Come to Whiskey Island to celebrate Ed’s 48th Birthday and the Dedication of the road leading to Whiskey Island Ed “Citizen” Hauser Way. Time: When you get there!! 7:00 PM: the Band “The Effect” will perform at the Sunset Grille for your entertainment!! Bring your own picnic and come enjoy the park that Ed fought so hard to keep green for us. Submitted by Susan Miller on Tue, 04/28/2009 - 12:45. Did this allay your fears of crossing the bridge? Hey, they can do it wrong and then we can pay more for them to fix it, right? No bikes - mentioned on GCBL. Should we stage a ride across it? What will it take for people to take notice? Here's what Ed had to say back in 2007. Unfortunately, not much has changed. ODOT still is not addressing water, air and soil quality impacts, and they have strong-armed preservationists into erasing our history (built environment impact). First of all, I want to congratulate you on your appointment as the director of the Ohio Department of Transportation. I was pleased to learn about an ODOT transition report and have a renewed hope in ODOT operations with Governor Strickland's and your "new ODOT vision." The report states, "The Strickland-Fisher Turnaround Ohio" plan outlines a new direction for the state that requires ODOT to engage more fully as a partner, to live within its means of available resources and to rethink its role as an agent for change and prosperity for all Ohioans. " My comments will focus on the Innerbelt Bridge Project, which ODOT has still not revealed to the taxpayers that it will cost $1.16 BILLION. To put the Innerbelt Bridge Project in perspective: (1) It is the most costly public works project in the history of Cleveland (Hopkins Runway project is $500 million); (2) It is over % of the cost for the entire Cleveland Innerbelt Project ($1.5 Billion). I am sending my comments and request directly to you because ODOT is still moving ahead with its Innerbelt Bridge Project without taking into account its "new ODOT vision." I understand that the new administration has inherited the Innerbelt Project problems, but we need your leadership get this project under control and do the right thing for Northeast Ohio. For over one year I have expressed my concerns about the Cleveland Innerbelt Project by submitting five assessments and numerous letters along with comments at public meetings and at the Section 106 consulting party meetings. • ODOT's Proposed Innerbelt Bridge Plan- Invalid because ODOT is conducting a flawed Project Development Process and Public Involvement Process. • ODOT's Proposed Innerbelt Bridge Plan- Demolishes three structures recommended for the National Register of Historic Places. • ODOT's Proposed Innerbelt Bridge Plan- $1.168 BILLION Innerbelt Bridge Project is the most costly public works project in the history of Cleveland! • Request to Public Officials - It's time to do this right and take responsible action to restore the public's trust and confidence in the State and Federal processes and to use our tax dollars wisely. • REQUESTED SOLUTION - Federal, State, County and City Public Officials must commission a "Peer Review" and hire an independent (unbiased) consultant to conduct a valid engineering study and economic impact study to compare the costs, feasibility, traffic interruptions and economic impact for ODOT's Northern Bridge Alignment and the "original" Southern Bridge Alignment (new two-way bridge). • The "original" Southern Bridge Alignment Alternative (new two-way bridge) was invalidly removed because ODOT and Burgess & Niple purported that it would take the Greek Orthodox Church in June 2005. • In November 2005, ODOT revised that claim by stating that the Southern Bridge Alignment would encroach on the Tremont Historic District, but never seriously reconsidered that alternative. • The original Southern Bridge Alignment Alternative was never fully developed and replaced by a "hybrid" southern alignment with a new East Bound Bridge and keeping the existing bridge. • Predetermined outcome for the Northern Bridge Alignment because ODOT began acquiring properties for that bridge alignment in November 2005 (PDP-Step 10) before the federal Section 106 Process began in May 2006 (PDP-Step 4). ODOT skipped 6 steps of the PDP! • Predetermined outcome for the Northern Bridge Alignment because ODOT claimed to have endorsements from public officials on January 21, 2006, prior to the release of the Conceptual Alternatives Study and the evaluation of public comments on the study. The public comment period for the study remains open until March 5, 2007. • The federal process schedule to inform the public on how and when to participate was released in November 2005. None of the scheduled items were followed and the schedule was not updated until December 2006. The public was removed from being involved in the process by not being able to provide any meaningful input while decisions were made concerning the Innerbelt Bridge. • The problems stated above clearly demonstrate major flaws in ODOT and federal processes. ODOT's Proposed Innerbelt Bridge Plan- Demolishes three structures recommended for the National Register of Historic Places. After reviewing the "Identified Historic Structures with Potential Impacts" display board at the public meeting on February 1, three (3) of the five (5) identified historic structures will be demolished if ODOT implements its "Recommended Preferred Alternative" for the Northern Bridge Alignment. • ODOT no longer references or displays any bridge alternatives that will not impact historic structures recommended for the National Register of Historic Places. • The flawed processes led to an outcome that will demolish three (3) historic structures without a viable alternative because the Southern Bridge Alignment Alternative was invalidly removed. • Cleveland will lose the historic Broadway Mills Building, Marathon Gas Station and Distribution Terminal Warehouse, which were recommended for the National Register of Historic Places. • The federal historic review processes for the NHPA-Section 106 and NTA-Section 4(f) will be jeopardized if ODOT and the FHWA fail to fully develop the "original" Southern Bridge Alignment (new two-way bridge) as an alternative. That Southern Bridge Alignment Alternative does not impact any structures recommended for the National Register of Historic Places. • These federal processes call for the consideration of all "feasible alternatives" that have the least impact to structures and sites eligible or listed on the National Register of Historic Places. ODOT's Proposed Innerbelt Bridge Plan- $1.168 BILLION Innerbelt Bridge Project is the most costly public works project in the history of Cleveland! On January 31, 2006, I submitted my "Assessment #1 Findings - Reguest for the FWHA & ODOT to: Correct the Project Development Process & Public Involvement Process and Reconsider the Southern Innerbelt Bridge Alignment Alternative - Reply Requested." This was the first of five assessments submitted to ODOT and FHWA that were never addressed or replied to. • My first assessment concluded by stating, "I will argue that the ODOT "Recommended Preferred Alternative"for the Northern Bridge Alignment will cost us over SI Billion. That is because ODOT has not acknowledged the cost to replace the existing bridée in the future." • We waited one year and two days (2/1/07) for ODOT to calculate the cost to replace the existing bridge and finally acknowledge that its proposed Innerbelt Bridge Project will cost taxpayers over ONE BILLION DOLLARS for its proposed Northern Bridge Alignment! • $1.168 BILLION is ODOT's projected total cost for the Northern Bridge Alignment Project. ODOT's numbers: $1,168,000,000 = $511,000,000 [New Westbound Bridge] + $137,000,000 [Repair Existing Bridge] + $520,000,000 [New Eastbound Bridge]. WOW! That's a lot of money! • The proposed BILLION DOLLAR Innerbelt Bridge Project makes it the most expensive public works project in the history of Cleveland and over 3/4 of the projected cost for the entire Cleveland Innerbelt Project ($ 1.5 BILLION). Over twice the cost of the Cleveland Hopkins runway project ($500 million), currently most expensive public works project. • ODOT did not provide the cost for the future East Bound Bridge or the entire cost of the Innerbelt Bridge Project to Cleveland City Council or the Cleveland City Planning Commission at the "Innerbelt Update and Overview" meetings in January 2007. • No Guarantee that ODOT will fund the future East Bound Bridge for $520 million in 15 years. ODOT has already begun slashing $1.2 BILLION for major construction projects from its budget. • The ODOT Project Development Process and Public Involvement Process- lack timely and factual information; lack true public involvement; and lack transparency in decision making. • I am losing all trust and confidence in these processes because of my experiences and treatment while actively participating in these processes. • Renewed hope with Governor Strickland beginning to "Turnaround" ODOT with a new director and stating the new leadership will re-examine Cleveland's massive Innerbelt Project. REQUESTED SOLUTION - Federal, State, County and City Public Officials must commission a "Peer Review" and hire an independent (unbiased) consultant to conduct a valid engineering study and economic impact study to compare the costs, feasibility, traffic interruptions and economic impact for ODOT's Northern Bridge Alignment and the "original" Southern Bridge Alignment (new two-way bridge). CONCLUSION - If our public officials choose NOT to commission the "Peer Review" for the Innerbelt Bridge Project stated above, I recommend a "Minimal Build" alternative for the Cleveland Innerbelt Project. That would entail straightening the Innerbelt Curve ("Dead Man's Curve") at $98 million and rehabilitate the existing Innerbelt Bridge for 50 years at $268 million for a total cost to the taxpayers of $366 million. That would save the taxpayers $1.134 BILLION ($1.5B-$366M) that could be used elsewhere. The citizens and taxpayers of Ohio cannot accept substandard state and federal processes that yield substandard outcomes! Let us hope that naming a road or bridge (designed to carry heavy loads - not just recreating travelers) to Whiskey Island is not the end (a form of mitigation?) 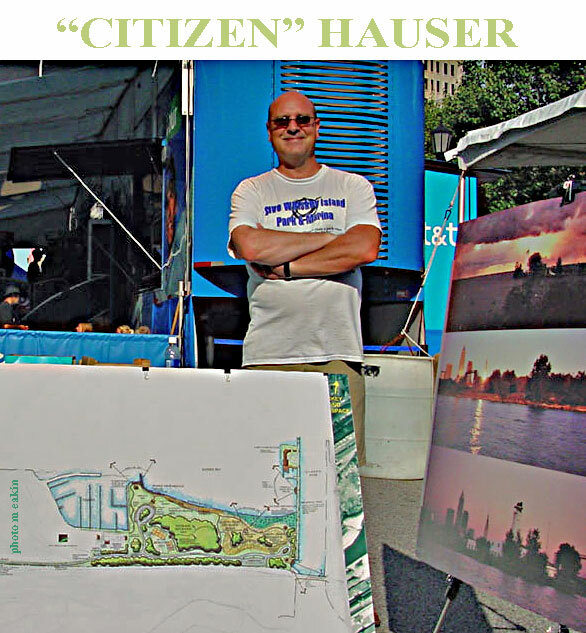 of the Ed "Citizen" Hauser Way. why straighten a traffic calmer? Submitted by TimFerris on Sun, 05/03/2009 - 17:18. I'm not sure we even want to straighten out what we call Dead Man's Curve, trying to pick up on the panache of the Jan and Dean song. These days, they call such things traffic calmers. There's nothing wrong with slowing down in the transition from the shorway to the innerbelt. We shouldn't encourage more speed. If it ain't really, really broke, don't spend $90 million to fix it. How long has it been that way? 40 years? Submitted by Quest-News-Serv... on Wed, 04/29/2009 - 00:27. Submitted by Norm Roulet on Wed, 04/29/2009 - 13:14. Submitted by Jeff Buster on Wed, 04/29/2009 - 11:29. Submitted by Norm Roulet on Wed, 04/29/2009 - 22:43. Submitted by TimFerris on Sun, 05/03/2009 - 17:13. At the link are 4 MeetTheBloggers podcasts recorded August 23, 2006, with Ed at our old digs in the Tower Press Building. Did you vote in the March, May, September and November 2010 Elections? (all that you were supposed to vote in; not just Nov).